I am a day late and a dollar short. 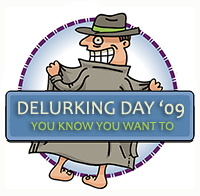 Yesterday was Delurking Day 2009. That is the day when bloggers ask those reading to leave a comment to let us know that you are really out there. Admit it, you probably read my blog and others, but do not always leave a comment. I know I am guilty of this. There are often blog posts that I want to leave a comment on, but something happens and well you know. One of my goals this year is to be better about leaving comments on the blogs that I read. I am still working on this. As a blogger I know how nice it is to have comments to read after writing a post. Sure, I am not writing for the comments, but it sure makes me smile and feel special to know that people are reading. So let’s keep this delurking thing going. Leave me a comment telling me something that you like to do when you have a little extra time or leave me a question. I promise to visit your blog and comment in return (if you have one) and will also e-mail you back. As many of you know, I always reply to my e-mail comments. :) I read! You know that right? I’m just horrible at commenting lately too… I am trying to be better about it. I think I just read too many blogs! LOL But I love them ALL! i read most every day…just dont always have some major comment yanno? I am going to try harder too. I’m several days late with this, but better late than never right? :) Something I like to do when I have a little spare time? Read blogs, of course!